Archbishop Romero, more properly Oscar Arnulfo Romero y Galdamez, was born in Ciudad Barrios, El Salvador on 15 August 1917 and joined the seminary of the Claretian Order when he was 13. When he was 24 he moved to the national seminary run by Jesuits in the capital, San Salvador. He was ordained on 4 April 1942 and worked as a parish priest from 1944 until 1966. In 1970 he became auxiliary bishop to the Archbishop of San Salvador Luis Chavez y Gonzalez and five years later, in December 1975, became bishop of Santiago de Maria. On 23 February 1977 he was consecrated Archbishop of San Salvador. On 12 March Father Rutilio Grande, a social reformer and a close friend of Archbishop Romero, was assassinated as he made his way to celebrate mass. Until his friend’s death Archbishop Romero had been a conservative man, unwilling to upset the status quo. The death opened his eyes to social inequalities and spurred him on to become a reformer. “If they have killed him for doing what he did,” he said, “then I too have to walk the same path.” The archbishop criticized the El Salvador government and the endemic corruption it created. He also spoke out against the torture and assassination of political enemies. In 1979 he was nominated for a Nobel Peace Prize. In February 1980 he had an audience with Pope John Paul II to express his concern about the happenings in El Salvador. The terror had increased, following the coup that deposed President Carlos Romero in 1979. In the 12 years that followed as many as 80,000 people died at the hands of death squads. The archbishop asked President Jimmy Carter to halt American aid to El Salvador but Carter ignored him. 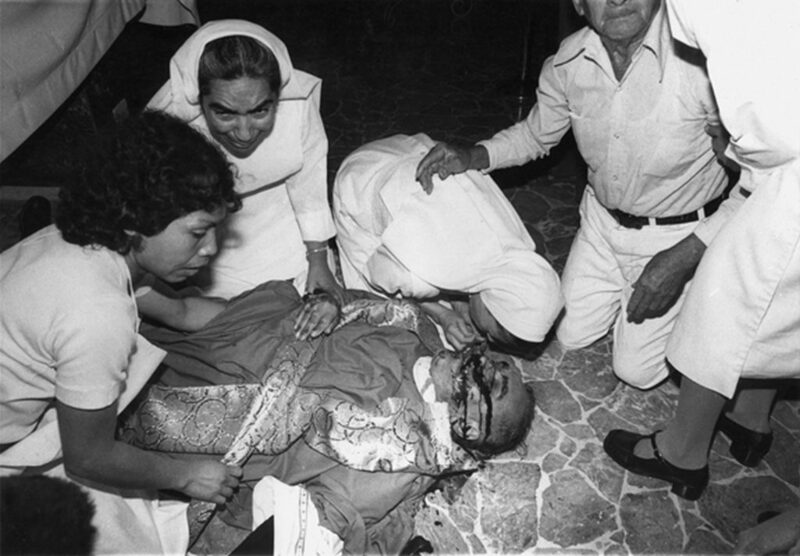 On 24 March 1980 the archbishop celebrated mass at La Divina Providencia, a small hospital chapel near his cathedral, when a group of men in combat fatigues burst in and shot him to death. Archbishop Romero’s funeral on 30 March 1980 was attended by more than a quarter of a million people. During the ceremony the government let off bombs and, in the confusion, murdered around 50 mourners. In 1993 a United Nations report identified Major Robert D’Aubuisson (who had died of cancer on 20 February 1992, aged 38) as the man who had ordered the killing. In 1997 Archbishop Romero was proposed for beatification, the first step on the road to sainthood.